Face it: As writers, we’re on the computer an insane amount of time. Eyestrain is real. There are ways to avoid it or reduce eye issues. Use adequate lighting in your office area. Have updated monitors that don’t have the old fashioned “flicker” issue. Keep the brightness/contrast adjusted correctly for the level of lighting you’re using. Make sure you get to your eye doctor regularly and keep your glasses prescriptions up to date. Be up front with your doctor. Mine groaned when I explained exactly how much time I spent on the computer—my day job is work-from-home editing. I freelance doing editing. I’m a writer. To relax, I read (on an e-reader, my phone, and ‘real’ books), play computer games, and watch videos. I do graphics and marketing—which all on the computer. He actually gave me some great tips for eye care, some included here. Simply being aware of the potential problems is a big help. Studies show that while working at a computer, people blink one-third as often (and not as hard) as they do normally. I cannot wear contacts—I don’t blink enough and they dry out, becoming like slivers of glass in my eyes. I tried and gave up. A couple of years ago when I was stressing myself out, my eyes became very dry. I started using the artificial tears/dry eye drops. (DON’T use the get-the-red-out drops; those are different, have additives that constrict blood vessels, and are not as lubricating. Those types are not for long-term use. Ask your eye doctor for recommendations.) I kept bottles by my computer, by my bed, and in my purse. I’m pleased to report that at this year’s eye exam, the doctor commented how much my eyes had improved, and that dry eyes were no longer a major concern. Honestly, I think the computer glasses mentioned previously helped substantially with that. The other eye-related suggestion is one I’m hearing from multiple sources lately. Medical experts recommend that while using a computer for an extended period of time, every 20 minutes, look at something 20 feet away for 20 seconds (the 20-20-20 rule). I solved this problem easily. I have my workstation in front of a window, and I put up a bird feeding station with five kinds of bird feeders and a little bird bath about 20 feet into my garden from the window. I look up regularly to watch the cardinals, goldfinches, and woodpeckers visiting the feeder, and have my 35mm camera nearby to snap some shots. Sometimes when I’m caught up in my work, the flurry of wings as a flock of bluebirds swoop in or the flash of a humming bird zooming by will remind me I need to look away from the screen for a few seconds. 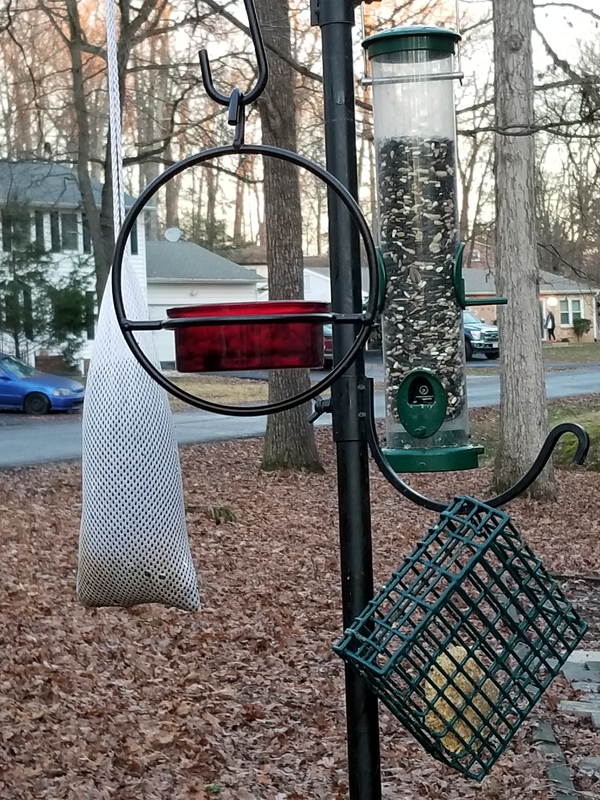 I love your bird feeder solution to needing to focus on something in the distance every 20 minutes you’re on the computer! Because that something you’re looking at is sure to relax and delight you. Good thinking! 🙂 And many thanks for the tips. Glad you’re finding it useful! !